This reviews the Leesa mattress after sleeping on it for 3 weeks. The Leesa company sells directly to consumer (online only), cutting out a lot of costs found with a typical mattress sale – thus I think the Leesa compares to mattresses 2-3 times its price. Overall I really liked the mattress, with only a few cons that mostly apply to very particular mattress shoppers. There is only one mattress model, which is geared towards the average sleeper. Thus if you prefer a very soft or very firm mattress, the Leesa isn’t the best choice for you. 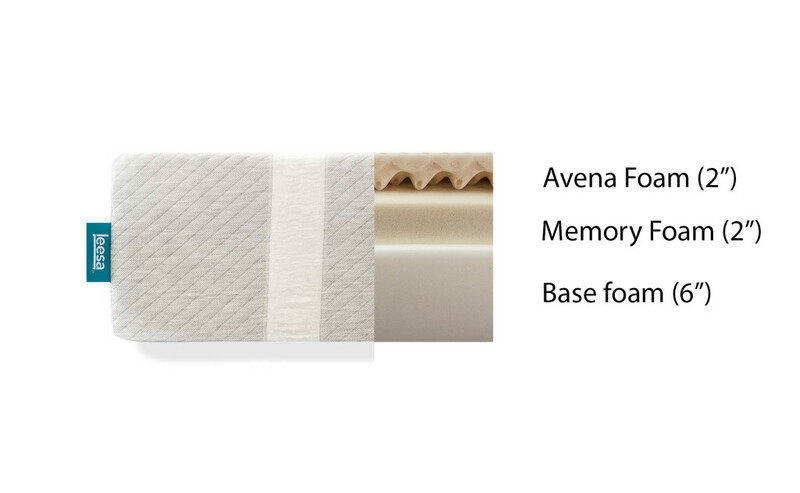 The Avena foam is most similar to a latex foam. The video shows this best, but it offers the contouring/support of memory foam while making the mattress not sleep hot (an important factor for me). The foam also adds a lot of “spring” to the mattress – meaning it pops back quickly after you’re sitting on it. This addresses a common complaint of memory foam, which maintains the sinking position much longer, making it somewhat difficult to move around in bed. I’d put the Leesa at a 6.5/10 on the firmness scale. This definitely targets the average mattress consumer, not too soft, and just firm enough to be comfortable while offering great support. I have a bad back, so the support is especially important to me – and the Leesa did a great job supporting my lower back, particularly when sleeping on my back. At this range, I’d say the Leesa could be a good option for most sleepers, whether you sleep on your back, side, or stomach. Though this mattress will suit the average sleeper, if you prefer a very soft or very firm mattress, Leesa currently doesn’t offer these in their product lines. You could always put a topper on to adjust the firmness level, but I generally don’t recommend purchasing a mattress with this intent. One thing I really like about this mattress is the thoughtful design. The cover looks and feels great, a knit fabric that is created in such a way that it has no seams. This is one of the best looking mattresses I’ve reviewed. Naturally you’ll throw a sheet on it immediately after opening it, so the look doesn’t truly matter, but in my mind good design shows that the designer was thoughtful about the product from start to finish. Since the company is new, we don’t have reports on how durable the mattress will be over time. However the foams are high quality, suggesting that the mattress should hold up reasonably well over time. In the event that the mattress doesn’t hold up well, Leesa offers a 10 year warranty to cover any major issues in performance. The return policy for Leesa is great – since they sell exclusively online, they really put some trust in their product by offering a 100 night no-risk trial. This means that after purchasing the mattress, you can return it within 100 days for a full refund. They will even have the mattress picked up at your house and donated, so you won’t pay shipping costs either way. Thus if you like the Leesa story and think it might be the mattress for you, I wouldn’t let fear of not trying it out before purchase stop you from ordering it. Leesa has all the standard memory foam certifications, specifically the CertiPUR-US, which means the foam is made without ozone depleters, without PDBE flame retardants, without mercury/lead/other heavy metals, without formaldehyde, and less than 0.5 VOC (volatile organic compound) particles per million (considered low for indoor air quality). That being said, memory foam is not generally considered an eco-friendly material. Leesa has met the industry standard for a memory foam mattress, but if having a natural/organic mattress is a priority, then you may need to look at latex or spring mattresses. The Leesa comes compressed in a box, and is fairly light compared to other mattresses I’ve received – though you will still most likely need a friend to help you move the box, especially when going up stairs. For me the off-gassing (smell) that always accompanies a new memory foam mattress was gone within a couple hours, but I don’t have the most sensitive nose, so let me know if you have a different experience. Check out our Leesa unboxing page if you purchase for some set-up tips and another view of the mattress. Leesa has a program that we’ve seen in other industries, but it’s the first time I’ve seen it in the mattress industry. Leesa has committed to donating 1 mattress for every 10 sold to homeless shelters to give back to local communities. I believe returned mattresses will be donated to this source as well. As I read your preferences, it seems you rank the Leesa as the best choice for you, even over the Loom and Leaf. Is this because for yhe money, the Leesa already meets your wish list and the Loom and Leaf almost exceeds what you look for in a mattress? Thanks. Hi Scott – Leesa and Loom & Leaf really have different feels. Leesa feels more like a hybrid, while Loom & Leaf more like a true memory foam mattress (think Tempurpedic). I wouldn’t say that Loom & Leaf exceeds what people look for in a mattress – but it is targeting more of a luxury buyer. It has more higher quality foam (is thicker overall) and more cooling technology – which is reflected in the higher price. Are you trying to decide between the two? I really like your two reviews. My wife and are are trying to decide between the Loom and Leaf and Leesa. We have a pretty good feel for what a true memory foam feels like, but are a bit unsure about what a hybrid feels like. Do you know a mattress that would compare with the Leesa? Hi Mark – thanks for the feedback! The hybrids feel more like a latex mattress in general – they have more “spring” that a memory foam mattress (easier to move around at night) and slightly more motion transfer (you’ll feel a little more movement from your wife, but certainly less than the traditional spring mattress). A lot of the new online-only companies are hybrids (but I’m guessing you don’t have access to these either)! If you want to try out a hybrid in a store, I’d start with the Serta iSeries or the Beautyrest Black. We mattress shopped for several months before ordering the Leesa king size. The first two-three weeks I was ready to send it back, then suddenly we both loved it. It’s pretty firm, and we’ve had a little trouble finding a platform type bed frame but when I travel I can’t wait to get home to my own bed. It’s so incredibly comfortable and I don’t feel my 6’3 200 lb. husband’s movements at all, they used to wake me up. With the coupon code and “referral” bonus we ended up paying less than $900. Much more reasonable than the $3500 mattresses we were looking at before. Glad that you like it! I’ve actually heard the same experience with the Leesa from a number of people – they’re OK with it for a few weeks, then something switches and they really like it. I’m also 6’3″ 200 lbs so me and my wife run that test on every mattress! Again glad you found something you liked (and didn’t have to drop $3500). I bought the Tuft & Needle mattress (10″ King) through Amazon, and it arrived yesterday afternoon. I eagerly set the bed up, placed a waterproof protector over it, and made the bed. About six hours later I went to bed, noticing a slight smell. I woke up in the middle of the night with a splitting headache and noticed the smell was much worse. My wife and I undressed the bed and took of the mattress protector, thinking that surely it was the cover causing the chemical stink. We slept on the couch. In the morning, the whole house reeked, so we turned the ceiling fans on high and left for work. When we got home, we could hardly believe how bad the smell was, and mind you, the mattress protector was OUTSIDE on the back patio. The whole house (1400 sq. ft.) smelled polluted. I called T&N to report the problem and they told me (nicely) that some odor is normal and would dissipate in the next few days. The customer service woman speculated that the foam was poured, cut, covered and shipped before it was fully cured. WTF?! I spent $750 on something that (at least for now) has rendered my home a hostile environment, causing me to have to open every window in it, while it is humid and hot (here in Florida). So, I am sleeping on the couch again tonight and may return this bed tomorrow if it is not dramatically better. I hope for them that this is a rare customer service disaster. Hey Brian – Tuft & Needle definitely smells more than most mattresses upon opening because it is very compressed (it looks like it comes as thin as possible). I noticed the smell as well, but I opened a window and let it air out, and didn’t notice the smell at all after about 8 hours. I imagine there is some variation though, very good to note! T&N also has a great return policy, so if the smell doesn’t go away I would definitely take advantage of that. Trying to decide between a Leesa vs Loom & Leaf. Have not used a memory foam mattress before but don’t really like the spring mattress I have know. I do tend to get warm at night so staying cool would be a plus. One of those mattresses you recommend over the other? Thansk. The feel is definitely different between Leesa and Loom & Leaf – with L&L feeling more like traditional memory foam (think Tempurpedic) and Leesa having more spring in the foam, but still offering good support. There is a price difference there as well – Loom & Leaf has a higher price point, but also put a lot more into the manufacturing (more layers of foam, lots of cooling technology). Both do well with sleeping hot, but for different reasons. I think both are a good choice depending on your preference, but if you’re willing to spend extra, start with Loom & Leaf. Hi! Thanks for your great reviews and forgive me if you’ve answered this somewhere else, but I didn’t see it anywhere. We’re deciding between the Casper and the Leesa and from all the research I’ve done, they don’t seem too different. We went to the Casper showroom today and really liked it, but then again anything seems better than what we currently sleep on. So…any advice on choosing between these two? Hey Lauren! I think they are pretty similar in feel – there is a slight difference, but I don’t think it’s big enough that you’d notice unless you lay on one right after the other. I’d say if you have already layed on the Casper and liked it, go for it! If Leesa intrigues you, can’t go wrong their either. Heat sensitivity is a big issue for me as well. I am deciding between the Leesa vs Casper mattress. I went to the Casper NYC showroom (really impressed) and I really liked it, however, it started to feel hot after a few minutes. Do you think the Leesa would be cooler? Would I be better getting a cool shield topper for the Casper/Leesa? Or should I look elsewhere? The Casper was just a little warm for me, as you described (I wouldn’t call it “sleeping hot”). Leesa I didn’t feel it sleeping warm at all. Which one is softer: Leesa or Casper? I think Casper is softer, but not by much. Hi Kenny. Thanks for all of your input, it’s very helpful. You said that you have a bad back, and that this mattress helped it. I also have a bad back (I can’t sleep longer than 4-5 hours without waking due to aches and soreness), which is why I am looking for a new mattress. I need something that relieves pressure from my low back. In your opinion, did the Leesa mattress seem like the best mattress for relieving pressure? The other mattress that I’m looking at intently is Loom and Leaf, but I am open to other suggestions. Thanks. Hi Blake – lower back is where my pain is as well, the right mattress can have a big impact (I’d look at upgrading your office chair if you’re sitting all day as well). Leesa and Loom & Leaf were both great for my back pain. For my personal experience, more of a latex feel is better for my back, so Leesa may be a better choice in that regard (it’s not latex, but has more of a similar feel to it than Loom and Leaf). However if you’re a stomach sleeper, Loom and Leaf is a bit firmer, so it might suit your preference better.